Windows 7 and 8.1 customers who have been force-fed Windows 10 are an unhappy lot. Now statements attributed to Microsoft spokesperson Lisa Gurry promise that, starting this week, new alerts in the Get Windows 10 process will offer users a clear choice to decline Windows 10. If that sounds familiar, consider the promise Windows honcho Terry Myerson made last October that "You can specify that you no longer want to receive notifications of the Windows 10 upgrade through the Windows 7 or Windows 8.1 settings pages." Eight months later -- and one month before the marched upgrades are expected to end on July 29 -- we may finally be getting some relief. Exactly what kind of relief is hard to say. 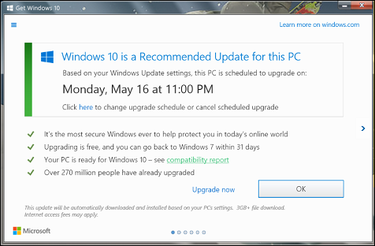 Unlike before, the alerts will now offer users a clear choice to decline Windows 10. And if users click on the red "x" button to dismiss the alert, Windows will no longer consider that a confirmation that users want to upgrade to Windows 10. After hearing from customers that the alert boxes were "confusing," Microsoft decided to change them, said Lisa Gurry, Microsoft's senior director for Windows. "We're working really hard to address it," she said. "We're working hard to deliver a Windows that everyone will really love." If you've been following my columns, you know all about the havoc created by the Get Windows 10 upgrade program: the "accidental" forced upgrades last October, dicey signup notices ("Upgrade Now/Upgrade Tonight"), hidden folders with 3GB to 6GB of unwanted downloaded data, and nagging Windows processes that automatically restart themselves. My squeaky-clean built-from-scratch Windows 7 test machines now show two different upgrade notifications: "Upgrade Now/Upgrade Tonight" and the more civilized "Upgrade Now/Start download, upgrade later" shown in the two screenshots below. Clicking the "X" on either of the notices is the only way out of the forced Win10 upgrade march. These are just two of the more than dozen Get Windows 10 notifications from Microsoft since the start of the GWX campaign last year. It appears the notifications are generated on the fly: When you click on the GWX icon in the system tray, next to the time, Windows generates a new notification based on unknown parameters. One commenter on AskWoody likened the tactic to the action of a polymorphic virus. Just a month ago, Microsoft posted new upgrade guidelines in KB 3095675, which includes the infamous "X doesn't work" version of the notification screen (see screenshot below). Whereas clicking the "X" on the first two dialogs is the only way to exit the upgrade, clicking the "X" on this new dialog only digs you in deeper, with an upgrade scheduled and ready to run with or without your consent. In all the cases I've seen since October, the upgrade routine puts a EULA up as soon as it's ready to re-boot into Windows 10 (see screenshot). By clicking Accept, you're really saying "Yes, it's OK to install Windows 10 on this PC." For many Windows 7 and 8.1 customers, it's the last (in some cases the only) chance to abort a Win10 installation. You can decide for yourself if that EULA constitutes adequate notification that your machine is about to be taken over. At least one judge thought Microsoft had overstepped its bounds. Gregg Keizer at Computerworld has an excellent recounting of the story of Teri Goldstein and her successful lawsuit against Microsoft that resulted in a $10,000 judgment. Court records show that Goldstein filed the lawsuit on Jan. 21 and received a favorable judgment on March 4. Microsoft appealed the decision on April 11, then abandoned its appeal on May 12 (t/h Annemarie at AskWoody). "My reason for taking them to small claims court was to collect monetary loss due me from this effect of their forced upgrade and also to hold them accountable for their wrongdoing. I urge every person who has a consumer issue to know their rights and fight back. Only then will large corporations begin to understand that they cannot just do what they want." Perhaps the new process, promised by Microsoft's Gurry, will invoke the promises made by Myerson eight months ago. Microsoft has stated it will stop its free upgrades on July 29. We're right down to the wire. Every indication is that Microsoft will continue to honor its own terms of engagement and avoid installing Windows 10 on PCs that have the right bits flipped in the Registry. Those of you who rely on GWX Control Panel or Never10 to fend off the Get Windows 10 beast should continue to receive protection.